With pumpkin in season I have been searching for new and creative ways to use it up! I happen to have pumpkin cookies at a friends birthday party not to long ago and wanted to try to make them my self. 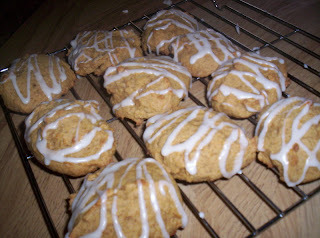 I came across a recipe at allrecipes called Iced Pumpkin Cookies. The recipe was delicious and the cookies made the house smell extravagant while they were cooking! I took them to a friends house that evening and they were a hit, everyone there really enjoyed them. The only thing I changed in the recipe was I didn't use as much sugar as it calls for. It calls for 1 1/2 cups to me that was just too much so I only used about 1/2 -3/4 cup of sugar, usually with any recipe you can half the amount of sugar and the product will still turn out with the same results. Granola is such a great snack! I love eating it in cereal, on top of yogurt or even on the go. 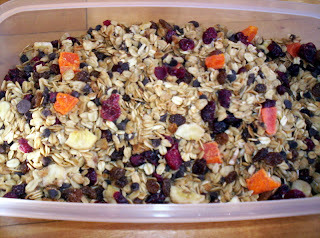 I have been searching for a good granola recipe for quite a while...but I finally found one that I really enjoy. This recipe uses only a little bit of fat and sugar to make the oats crispy; the rest of the ingredients that you add could make the the sugar and fat content high but if you choose the right ingredients this can be a jammed packed snack loaded with lots of nutrients and energy. The recipe I used is from Company's Coming "Kids Do Snacks" I did change the recipe so here is my altered version. 1. Preheat oven to 350 and grease a baking sheet with cooking spray. Set aside. Place margarine and brown sugar in a sauce pan on medium heat. Heat and stir until melted and smooth; remove from heat. 2. Stir in the oats, vanilla and cinnamon until coated. Spoon oat mixture onto baking sheet and spread evenly. Bake for 10-15 minutes stirring occasionally, until golden. Wait 30 minutes for oats of cool down before transferring to a bowl. 3. Add remaining ingredients and toss together. Store granola in air tight container. ~ You can be as creative as you wish with this recipe. Check out your local bulk barn to get great deals on dried fruit, nuts and seeds to add to your mix. If you children are not allowed to take nuts to school just substitute the 1/2 cup of nuts for more dried fruit. The fall adds not only beautiful colors to the great outdoors but it is the season of many foods that are loaded with beneficial nutrients! These foods can be harvested from your vary own back yard garden or picked up at your local farmers markets. Its a good time to get these foods well they are in the prime of their season. Many of them can be frozen for the long winter months when their availability diminishes causing the price to double or even triple. Here are just a few of the many fall Harvest Foods! Apples: Are rich in fibre, which helps to lower cholesterol. They have also been known as natures toothbrush because they stimulate gums, increase saliva flow and reduce the build up of cavity causing bacteria. This is the prefect time to pack up your family and head to a local U-pick to get your own apples. They can be eaten fresh, baked, made into apple sauce or used in many other recipes such as pies and apple crisp. Beets: Are a two in one food. The tops which are dark green are rich in calcium, iron, beta carotene and vitamin C. These can be cleaned, steamed and enjoy with a little bit of margarine and vinegar. The bottoms of the beats are an excellent source of folate, fibre, potassium and vitamin C.
Carrots: Are one of the richest sources of beta-carotene, which is also known as vitamin A. Vitamin A is helpful as its forms and maintains healthy teeth, skeletal and soft tissue, skin and it help promote good vision, especially in low light. Carrots make an excellent side dish. Why not get creative this season and enjoy a bowl of pureed carrot soup! Cranberries: The beautiful red color of this tart berry comes from anthocyanins, powerful antioxidants that may lower disease rick. Cranberries also contain vitamin C and fibre. Add these berries to muffin or bread mixes for a new flavor. Pumpkin and Squash: These two foods are rich in beta-carotene, potassium and fibre. Squash can be added to any meal as a side dish. It is also great as a soup or in dessert (squash pie). Pumpkins are not just for show during this season. There insides are delicious and can be used to create many dishes! 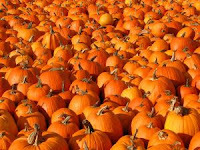 Try pumpkin in soups/ stews, casseroles, muffins, cookies and of course pie! 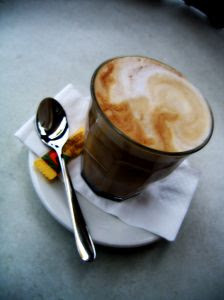 This season Lattes seem to be all the rage! They come in many different flavors; the one that sparked my attention the most was the pumpkin latte I was seeing advertised in many places. So of course instead of paying a small fortune for one of these things at a local coffee shop I began to search the internet for a recipe. I came across many different ones, mixed some of them together and this is the delicious recipe I came up with. 2. In a blender puree the milk, pumpkin, cinnamon, nutmeg, cloves, brown sugar and vanilla. Pour into a small saucepan and cook over low heat until the milk is warm and begins to froth slightly. (About 4-5 minutes.) Remove from heat. 3. For each serving: Pour 1/2 cup of the pumpkin mixture into your coffee mug. Add 2 generous tablespoons of Coffeemate creamer. 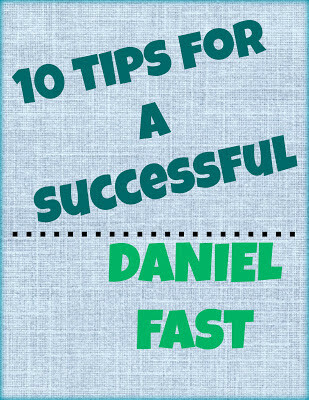 Heat in the microwave for 30 seconds, then add 1 cup of brewed coffee. Add 2 to 4 teaspoons of sugar (depending on how sweet you like your drink, I added 3 tsps.) Top off with a touch more ‘pumpkin milk’ then cover with whipped cream and sprinkle with nutmeg. Serve immediately. This is a great drink because you can make it with just the milk to ensure you are getting your 2-3 servings of milk each day or you can make it with decaf coffee so you still get the flavor without too much caffeine. I just love Thanksgiving! Its on of our favorite times of the year as the weather begins to cool down and the leaves on the tree become the most beautiful colors! Of course at Thanksgiving there are many traditional favorites that we all look forward to. Turkey, stuffing, cranberry sauce, squash, vegetables, pumpkin pie and lots more tasty treats. Last year I found a yummy recipe for Sweet Potato Pie and decided to give it a try to add to our dessert collection at our family feast. It was a hit! Combine flour, salt and cut in margarine until course crumbs are formed. Beat together in a measuring cup egg and vinegar; then add enough water to measure 1/3 cup. Add this mixture to the flour mixture and mix until dough clumps. Press into a ball and refrigerate (~ 1-2 hours). Roll dough out between wax paper and put into pie plate; chill until ready for filling. Beat together eggs until foamy; blend in sweet potato, cream/milk, brown sugar, salt and spices. Pour mixture into shell. Bake in 425 oven for 15 minutes; reduce heat to 350 and bake for 40 minutes. This pie is great served by itself, with vanilla ice cream or cool whip! To get the maple leaf design on the pie I simply went on a walk and found the biggest maple leaf I could. When the pie was cooling down I placed in onto the pie and sketched around it with a toothpick. Sweet potatoes are an excellent source of vitamin A (in the form of beta-carotene), a very good source of vitamin C and manganese, and a good source of copper, dietary fiber, vitamin B6, potassium and iron. This root vegetable should be consumed not only at thanksgiving but all year around because it's filled with so many good nutrients. Welcome to Kate's Kitchen. 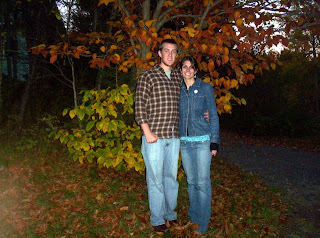 I have been wanting to add an additional blog that is just my own to our blog for quite a long time...however life just got busy and I never found the time; until this beautiful fall day. One of my greatest passions, besides loving and serving Jesus, is nutrition. I have been interested in it for a long time. That's probably why after high school I headed off to St. Francis Xavier University to take their BSc in Human Nutrition. Four years later I graduated from there and just recently have completed a Dietetic Internship program which enables me to become a Registered Dietitian of Canada. I love teaching people about nutrition topics and I love learning about nutrition myself. I also love being in the kitchen "cookin" up new recipes or putting a twist on old family favorites. That is why I have created this blog, to share with others nutrition information and lots of yummy recipes. Being frugal in the kitchen is something that makes me tick. I love getting good deals at the grocery stores and farmers market. I will also be posting lots of money saving ideas and recipes that I have learned over the past two years and that I continue to learn. 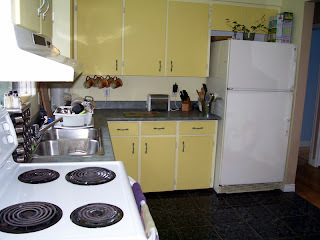 I hope this blog brings joy into your kitchens and around your kitchen tables.